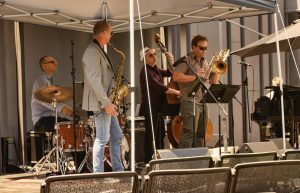 The sun was beating down inexorably on the State Theatre Courtyard on Sunday, the last day of the Perth International Jazz Festival. I was there to hear the Pete Jeavons Quintet, a group of jazz musicians led by bass player Pete Jeavons who have played together for so many years their solos are cued seamlessly and in perfect harmony. You would have to travel very far indeed to find a better group of jazz musicians and yet the venue appeared almost empty. This made no sense at all. The quality of the jazz warranted sell-out crowds. I found protection from the sun in a small shady section jam-packed with enthusiasts. The set opened with an original composition called Flipside and continued with some of Jeavon’s original compositions alongside re-arrangements of standards like Irving Berlin’s The Best Thing for You is Me. Jeavons re-harmonised Jerome Kern’s Yesterday so extensively that he re-titled it The Days before Today. The quintet was a sheer joy to hear. The very appreciative and enthusiastic crowd-in-the-shade laid testament to the quality. Solos from Jamie Oehlers on saxophone, Jeremy Greig on trombone and Tom O’Halloran on piano were held tightly together by the magical rhythm-keeping of drummer Daniel Susnjar and Pete Jeavon’s sublime double bass. Moving out of the sun to the Rehearsal Room the Kate Pass Kohesia Ensemble offered a varied jazz experience with strong Persian influences mixed with contemporary jazz. The microtonal elements of Esfander Shahmir’s daf (frame drum) and Mike Zolker’s oud playing were well backed and harmonised by Marc Osborne on saxophone, Ricki Malet on trumpet, Chris Foster’s piano and the brilliantly versatile percussion of Daniel Susnjar. Pass provided musical direction, composition and the tempered sounds of her bass. Selections from the 2018 album Kohesia included Nahafsi, Catalyst, Origin and Moongate and showcased Pass’s well-articulated melding of Persian folk music and western jazz. The band’s superlative musical improvisation was underpinned by the cadence of Daniel Susnjar’s drumming. The husband and wife team of Satoko Fujii and Natsuki Tamura stretched the range of jazz much further. The Japanese duo’s journey to Perth began with a chance meeting with festival artistic director Mace Francis in New York. They played to a well attended audience in the State Theatre’s Rehearsal Room. Publicity material promised they would premiere Fujii’s Fukushima suite commemorating the 2011 earthquake in Japan. Instead Fujii and Tamura played the following original compositions; Dune and Star, Prime Number, In Barcelona, Climb the Rapids, Riding on the Clouds and finally Spiral Staircase. The tunes were on the very edge of experimental jazz drawing heavily on classical music phrasing. 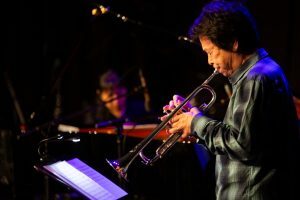 Fujii’s use of the piano was expertly combined with Tamura’s use of the trumpet. I say ‘used’ because they managed to get completely unique sounds from those instruments. Fujii produced sounds that emulated a range of instruments from Tibetan singing bowls to the violin, complemented by guttural wind music emanating from Tamura’s trumpet and interspersed with poignant use of silence. Fujii and Tamura played off each other in a way that can only be arrived at after a lifetime of working together. The result was at once ethereal and powerful evoking visions of the proverbial lone piper. The music was presented with little or no cognisance of western jazz traditions and demonstrated the anger and power of elemental nature. This certainly was not the piano and trumpet as we know them. As the festival drew to a close I marvelled at the quality and range of the performances, both international and local. Big thanks to Francis and the dedicated crew who put on this great weekend of jazz. The mix of paid and free events was very well balanced; one of the best Perth International Jazz Festivals so far. To quote Shrek’s Donkey “Wow, Let’s do that again!”.